Sens. 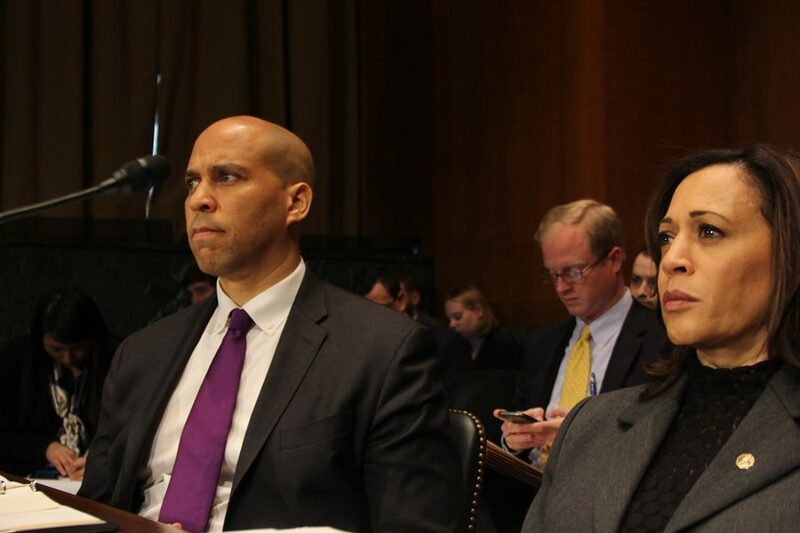 Cory Booker (D-N.J.) and Kamala Harris (D-Calif.) listen during a Senate Judiciary Committee hearing on Thursday. Senators narrowly approved Northwestern alumnus Michael Brennan (School of Law ‘89) to a federal judge position 11-10. WASHINGTON — Senators narrowly voted Thursday to advance through the Judiciary Committee the nomination of Northwestern alumnus Michael Brennan (School of Law ’89) to a federal judge position amid controversy surrounding his appointment. President Donald Trump nominated Brennan in August to fill an empty seat on the United States Court of Appeals for the Seventh Circuit, covering Illinois, Indiana and Wisconsin. The Senate Judiciary Committee approved Brennan with a vote of 11-10. Brennan will have to be approved by the full senate. Brennan previously faced criticism from Sen. Cory Booker (D-N.J.) during questioning in a January hearing. When Booker asked Brennan whether implicit racial bias existed in the judicial system, Brennan said he wasn’t familiar enough with the data to say. Booker said Thursday that Brennan’s nomination was “stunning and absolutely unacceptable, if not offensive.” Booker challenged his colleagues to talk to black families in their districts about their experiences. “Having a federal judge ascended to the bench who has not even a willingness to acknowledge a problem is, to me, not just insulting — but it is dangerous in a country that still has so much work to do to achieve our ideals of liberty and justice for all,” Booker said. Brennan could not be reached for comment. Gass Weber Mullins, Brennan’s office in Milwaukee, deferred comment to Steven Biskupic, a lawyer who has been a colleague of Brennan’s since the 1980s. Biskupic told The Daily it’s not unusual for a judicial nominee to face criticism. “While some senators may be expressing some concerns, I think certainly those of us who know Mike Brennan here in Wisconsin know that he will be an outstanding judge,” Biskupic said. In the January hearing, some committee members highlighted his resume and NU degree. Brennan’s nomination also faced scrutiny from several Democrats on the committee who said chairman Sen. Chuck Grassley (R-Iowa) broke from tradition in pushing through his nomination. A century-old Senate Judiciary Committee practice allows for senators from the nominee’s home state to weigh in on the candidate with a “blue slip” to express approval or disapproval of the nominee. Sen. Ron Johnson (R-Wis.) returned his slip, but Sen. Tammy Baldwin (D-Wis.) did not return hers. However, Grassley still proceeded with Brennan’s nomination. Sen. Dianne Feinstein (D-Calif.), the top Democrat on the committee, called the break from tradition a “huge mistake” on Thursday. While she acknowledged that the “blue slip” tradition has never been codified, Feinstein argued that under Democratic leadership, the committee has refrained from holding hearings for judicial nominees if Republican senators from the nominee’s home state had any objections. Grassley defended his decision to hold hearings for Brennan’s nomination, pointing out that the chairman can decline giving a candidate a hearing even when they’re endorsed by their state’s senators. A previous version of this article incorrectly stated the implications of Thursday’s vote. Brennan’s nomination will not be final until approved by a vote from the full Senate.